Melon vines take up too much garden space. This past summer, we grew all of ours away from the vegetable beds. I planted them under fruit trees where they had room to roam. 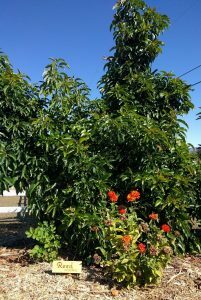 In the photo above, a Sweet Crimson watermelon is growing “under” a young Hellen avocado tree. 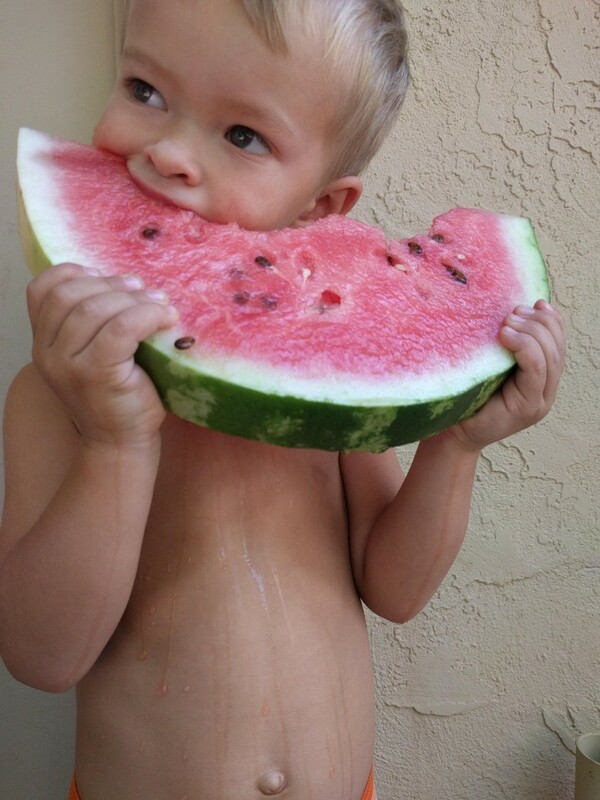 And in the photo below, the watermelon is being enjoyed, to say the least. Big brother eats the heart out. 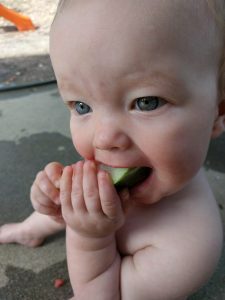 Baby girl uses the rind for teething. 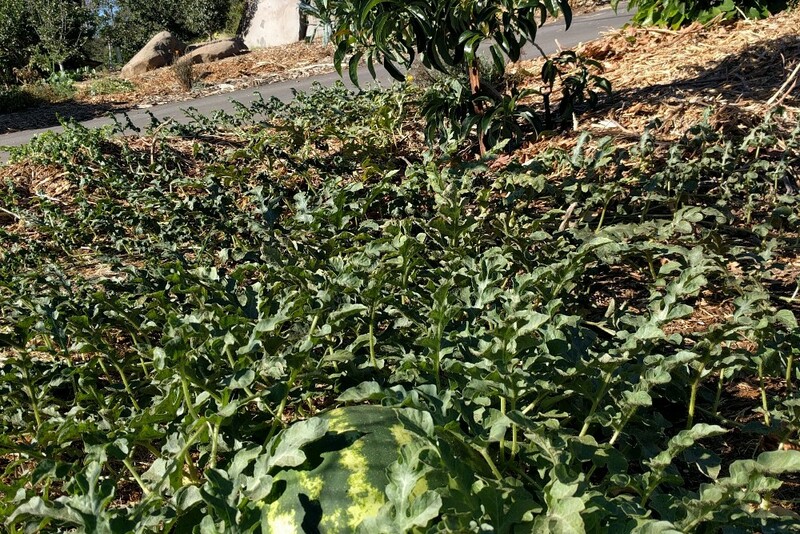 I planted that watermelon seedling on June 27, and the partnership of watermelon plant and avocado tree worked great because they both needed lots of water through the summer heat. They also complemented each other’s sun needs, as the avocado tree grew up to gather light while the watermelon ran laterally, away from the Hellen tree, to soak up rays on the ground. 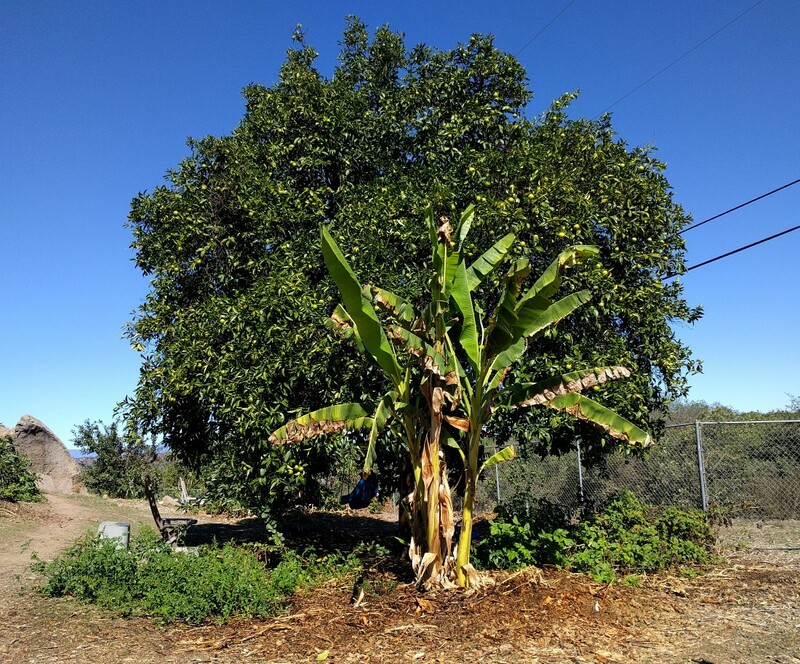 Incidentally, the avocado tree enjoyed the watermelon’s leaves shading the ground and cooling the soil — especially during those intensely hot early July days. 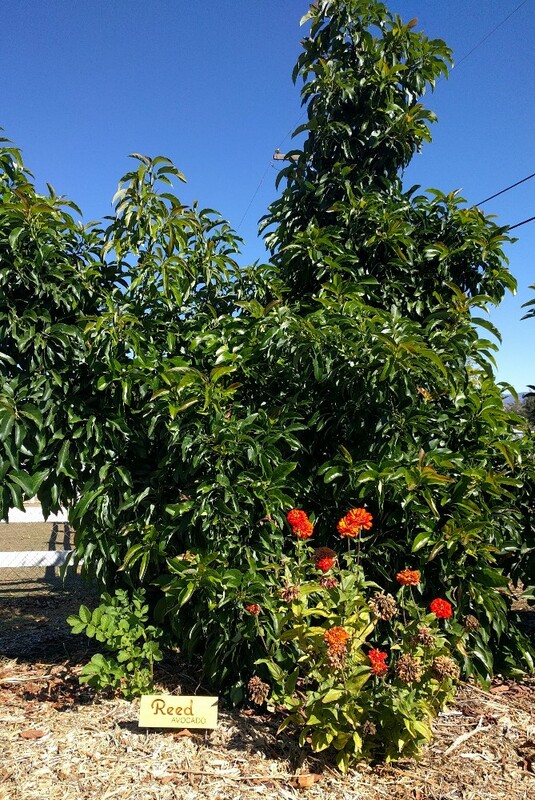 I handwatered the watermelon plant for the first week or two, but then the mini-sprinkler on the avocado tree irrigated the watermelon as it watered the avocado tree from then on. 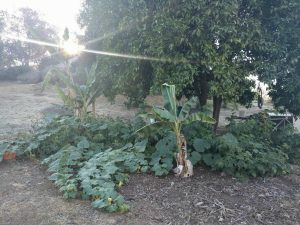 I also grew honeydew melons under another avocado tree, which did great. Melons and avocado trees are an excellent combination. 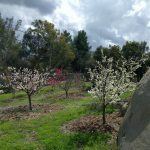 Other combinations of plants under fruit trees that I’ve tried have not always worked so well. Last fall, I planted garlic under my SpiceZee nectaplum tree and this combination didn’t work well. It was the rain’s fault. No, really it was my fault for expecting rain. The garlic began to grow, then it turned to winter and I stopped watering the fruit tree because it had lost its leaves and only needed minimal soil moisture, but the rains never came to take care of the garlic. In spring, I ended up with tiny garlic heads. Of course, I could have watered the garlic individually, but the point in planting under fruit trees for me is in saving something: space, water, time, work. It would have worked better if I’d planted the garlic under a citrus tree since you still need to water citrus trees through the winter if there’s no rain. So you must coordinate the water needs of the vegetable plant (or melon vine, etc.) and the fruit tree. Also, you must coordinate the light needs of the two. 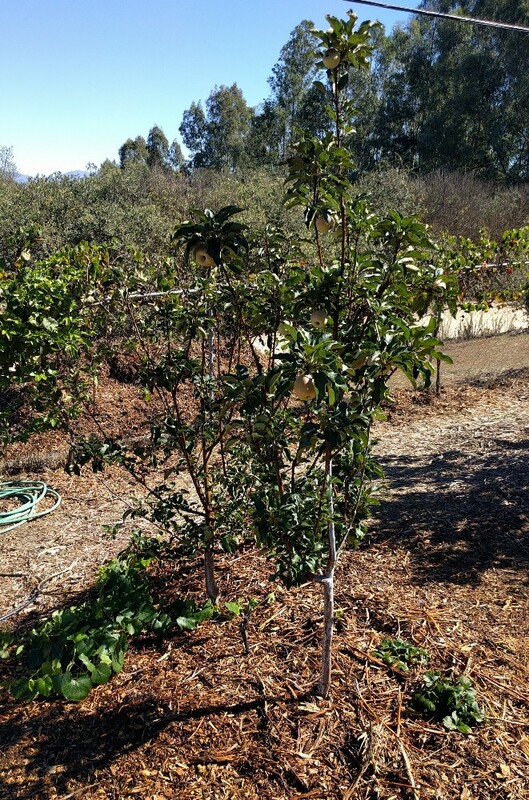 The garlic, for example, must be planted under the south side of a citrus tree. It is growing through the winter. If it’s on the north side, it will be shaded most if not all of the day. Under the south side of an adjacent Pink Lady apple tree, I planted a couple strawberries. I’m glad I only planted a couple because we still need to walk around the tree to harvest fruit. Strawberries all around under the tree would get trampled, especially by the kids. Grapevine growing from cutting on left, now in shade again since it’s fall. Strawberries on right. One of my favorite vegetables to put under fruit trees is potatoes. The reasons are that potatoes love to grow surrounded by mulch, and I love to mulch my fruit trees. You just scoop back some mulch, drop a potato, and cover it back up with mulch. A few months later, after the potato plant has grown up and then died, you scrape the mulch away again to find new tubers. Since they form within mulch, the potatoes are very clean already. That’s a bonus. Potato plant on left, plus some zinnia flowers on right — all under southern canopy edge of Reed avocado. No longer do I sow cilantro in vegetable beds. Here is one case where I’ve completely switched over to planting only under fruit trees. I’ve got a few permanent patches of cilantro where they grow during winter and spring, set seed and die off through summer, then with the first fall rains they grow again. Cilantro is so reliable at self-sowing, I’ve found. This cycle has been running for a handful of years now, with no end in sight. It’s like free cilantro every winter and spring. Onions grow well under fruit trees then too. Now, if only those were the seasons in which tomatoes and peppers grew, we could have permanent salsa patches. I’d put one under the lime tree, and a couple under avocado trees to complement guacamole. If only. 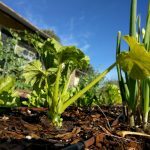 Can you go overboard and plant too many vegetables (etc.) under a fruit tree? Maybe. I may have broken the limit this summer of what could be grown well under a large Valencia orange tree in my yard. Between the spring and now in fall, under that single tree’s canopy edge has grown peas, tomatoes, beets, bananas, coffee, raspberries, pumpkins, avocado seedlings, potatoes, onions, apricot seedlings, what else am I forgetting? There were a few problems encountered. One was that the light wasn’t quite sufficient for everything to grow well. It was just too crowded. Another was that I couldn’t seem to keep enough water in the soil to satisfy all those plants during the summer heat. I had to add extra water by hand all the time, and that’s not saving water or time. Tomatoes to the west, one banana mat, and raspberries on east side (which enjoy shelter from afternoon sun). I came up with this notion of planting vegetables etc. under fruit trees, by the way. All by myself. I’m so clever. Oh, wait. Take a hike in the hills and you’ll notice everywhere small plants growing under trees. 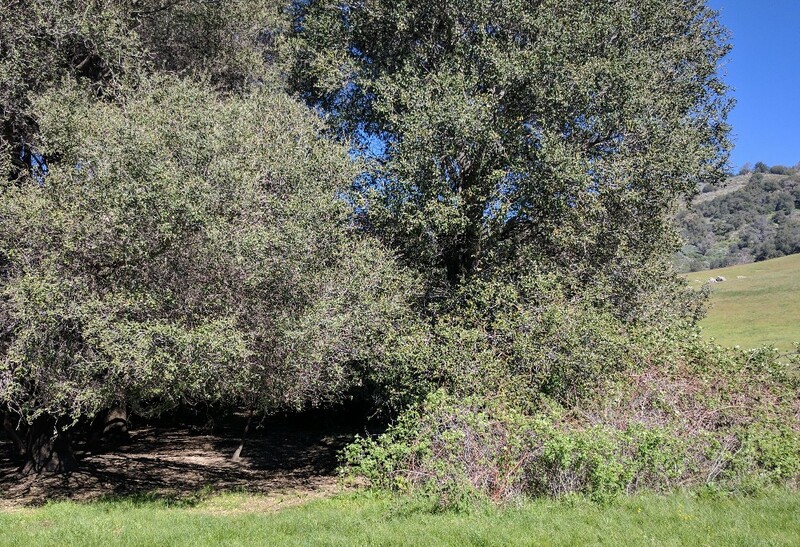 A couple years ago, I took this photo of wild currants and blackberries growing under the eastern canopy edge of these coast live oak trees. They must’ve learned this from watching my raspberries under the orange tree. Copycats. Wild currants and blackberries beside live oak trees in Santa Ysabel Preserve. I love this idea! 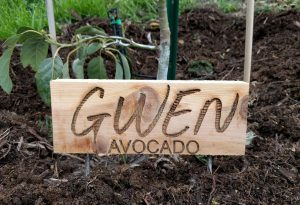 Next year I’ll definately plant pumpkins under my avocados. This year I got several BIG pumpkins! I did have a volunteer tomatoe under my little Fuji apple tree. Both got watered, and both were/are loaded with fruit! I’m learning so much from your site. Thank you! 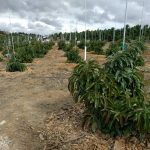 My avocado trees are planted on a slope? Do you think I could plant vegetables on the slope too? In early summer I planted tomato under a plum tree and didn’t water it the whole hot summer. I picked 70 tomatoes from Aug to Sept. I’m expanding to incorporate more of my irrigated trees next summer. What a harvest! I was just talking to a friend about why my tomatoes under trees don’t produce as well as my tomatoes in the garden and I realized that I’ve been planting too many too close together under the trees, and I’ve also just been letting them crawl on the ground rather than staking or caging them upright. Next year, I’m going to plant only one per tree and support each properly. Hopefully then I can approach a bountiful harvest like yours. What do you think about setting up raised beds close to the roots of trees? I would think that tree benefits from the water and nutrients that flow down from the raised garden beds, and the plants in the raised bed could get shade during harsh summer months (Santee, California). I would think this could expand the diversity of plants, since you wouldn’t harm the tree’s roots when harvesting. Would the tree roots invade the raised beds? That could certainly work. How well it might work would depend on the kind of trees and amount of shade. I once grew vegetables under a eucalyptus and that tree’s roots were constantly aggressively invading the root zones of the vegetables. It wasn’t ideal. I’ve grown tomatoes at the edge of my large orange tree, and I’ve found that in order to produce well they can’t be too close to the canopy because tomatoes really love lots of sun. 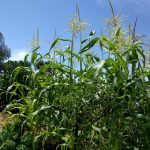 So you’d just have to manage these little factors of which trees, which vegetables, and correct placement, but the raised garden beds near or slightly under certain trees could work if done right.